Visual feedback from peers helps players understand what comprises effective and accurate passing when using the acronym CLAPP. The pass is the skill players must do most regularly but one where poor understanding and technique leads to inconsistent results and accuracy. Follow this fun practice to help players show understanding of the skill to improve effectiveness and consistency. Catch the ball by reaching for it early. Provide the passer with a target (hands ahead of body). Fingers spread and pointing forward and up. Avoid having fingers pointing directly up – and keep the ball off the chest. After the ball is caught, head turns quickly before the hands (“head beats hands”) to sight the opposition in front as well as the next ball receiver. 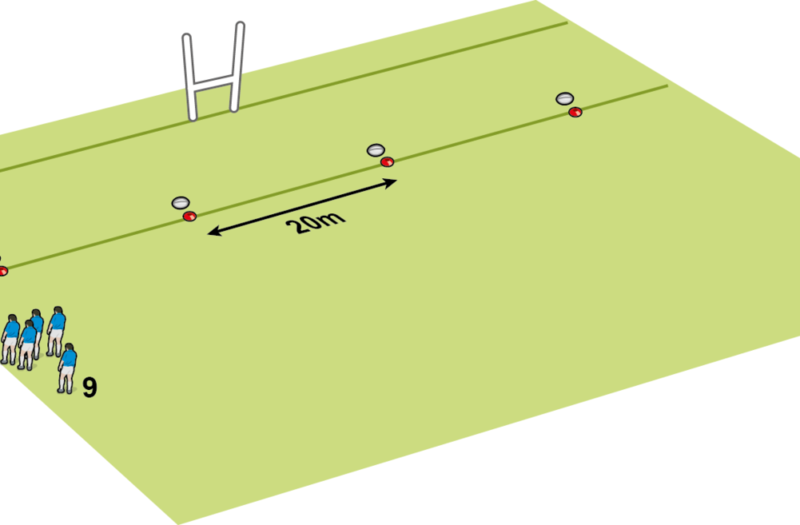 Focus on the desired line of flight of the next pass – in front of the receiver. Pass the ball in a flat, controlled and relaxed way, across the body, in a series of flat lines. Don’t allow the ball to drop in a “U” shape as it comes across. Player 1 runs 3m before passing to player 2. Player 2 runs 3m before passing to player 3. At the end of the channel, they jog back to the start and pass from the other side (left to right). The middle player has eight passing shuttles before swapping roles. If the middle player (2) completes all five parts of the CLAPP skills, the judges raise the appropriate cards. Every time a player gets a full set of CLAPP cards raised he gains a point.